This sequel to "Compromise-Indeed!" reveals how much the resignation of Justice David Davis from the Electoral Commission (and the Supreme Court) changed cartoonist Thomas Nast's view of the legal remedy for the disputed election. Whereas before, he deemed the commission to be a capitulation to Democratic intimidation; here, the artist promotes it as a chance to set aside threats and to settle the impasse as gentlemen. The bullwhip from "Compromise-Indeed!" 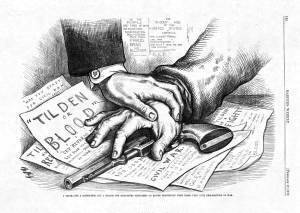 is now out of the picture, while the gun has been laid on the table with the help of the steadying hand of Uncle Sam (note the "US" cufflink).